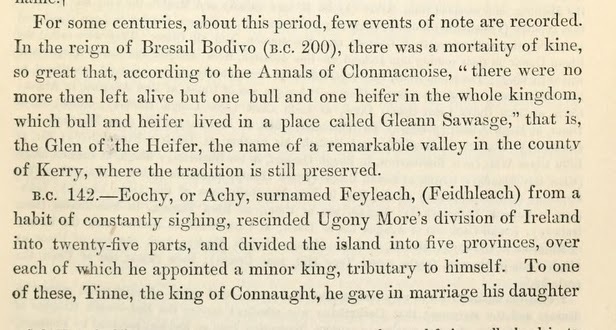 The above story about Bresail Bodivo is from Martin Haverty's The History of Ireland, Ancient and Modern (1867). It quotes from the Annals of Clonmacnoise a story which is familiar from the Metrical Dindshenchas - a story that appears to describe the reason the Dowth passage-mound in the Boyne Valley was built. Here is the Dindshenchas version. 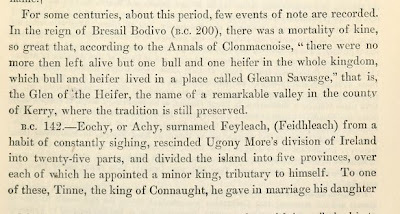 The above version from the Annals of Clonmacnoise names the valley where the bull and heifer lived - Gleann Sawasge. Land of the Ever-Living ones books have arrived! The printed copies of 'Land of the Ever-Living Ones' have arrived from the printer. It's nice to have them well in advance of the launch and not to be worrying about whether they will arrive on time. I decided to put the new novella up against my other books, 'Island of the Setting Sun' and 'Newgrange: Monument to Immortality'. I think they look really well together. They are three very vivid and well designed covers. Being a much smaller book, LOTELO looks almost like the baby with its parents in this picture! The Amazon Kindle version has begun to sell, and people are already reading it, which is fantastic. Don't forget, if you like it, give it a positive review. This would be very much appreciated. And it might help to sell a few more. In the meantime, don't forget to check out the book's official blog page here, and also my new author profile on Good Reads. 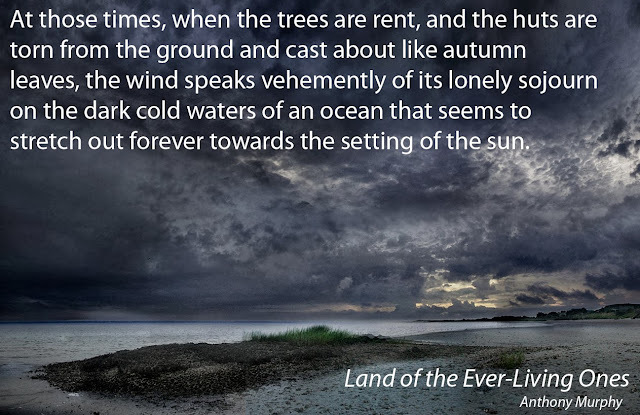 Also, you can read more about Land of the Ever-Living Ones on its Facebook page. 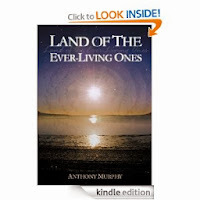 Land of the Ever-Living Ones now available as an eBook to purchase on Amazon Kindle! In the meantime, if you would like to read it you can get it on your Kindle. If you enjoy it, I would greatly appreciate a nice review on Amazon. And, of course, don't forget to give me your feedback in a comment on this blog. Thank you very much. The henge known as Site P. Click image to see larger version. The partially destroyed henge known as Site P, one of a number of henges in the Boyne Valley near Newgrange, is clearly visible in new imagery on Google Earth. 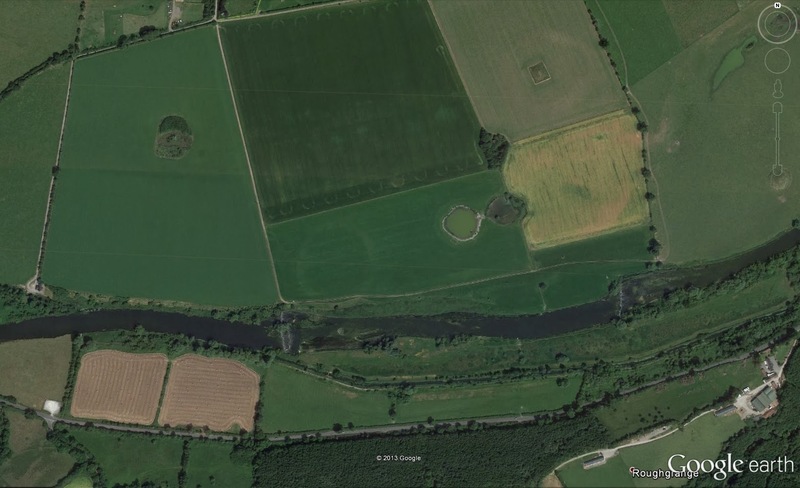 Google recently updated its imagery of the Boyne Valley area. This satellite image was taken in July 2013. 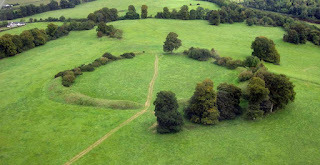 The henge is clearly visible as a crop mark near the Boyne river. It is located immediately west of a double "ritual pond" feature and is one of a large number of monuments in the Bend of the Boyne. For a map and information about all these sites, see Mythical Ireland's Boyne Valley Ancient Sites Interactive Map. A short video featuring some extracts from a wonderful new book called 'Tóchar - walking Ireland's ancient pilgrim paths' by Darach MacDonald. 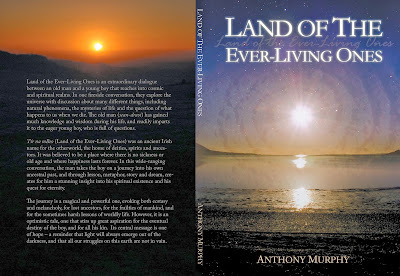 Read by Newgrange author Anthony Murphy. This Friday, October 18th, the Full Moon will undergo a penumbral lunar eclipse as it passes through the outer region of Earth's shadow. During this type of eclipse the Moon will darken slightly, and this can be observed without any special equipment. Unlike a solar eclipse which may last only a few minutes, a lunar eclipse can last hours and is viewable by anyone on the night-side of Earth. 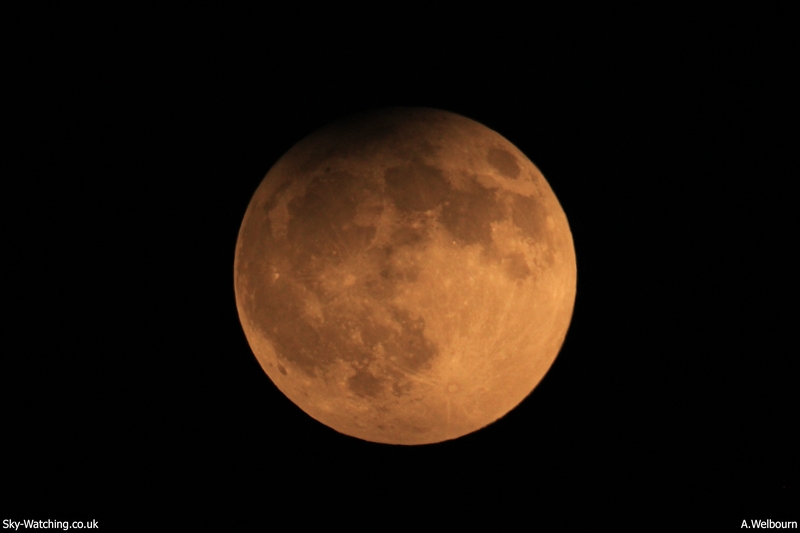 The eclipse will begin at 10:50pm when the Moon begins to enter Earth's shadow. By 12:50am (then into Saturday morning) the eclipse will be at its greatest, and almost all of the Moon will be slightly darkened by the shadow. The eclipse ends at 2:49am. 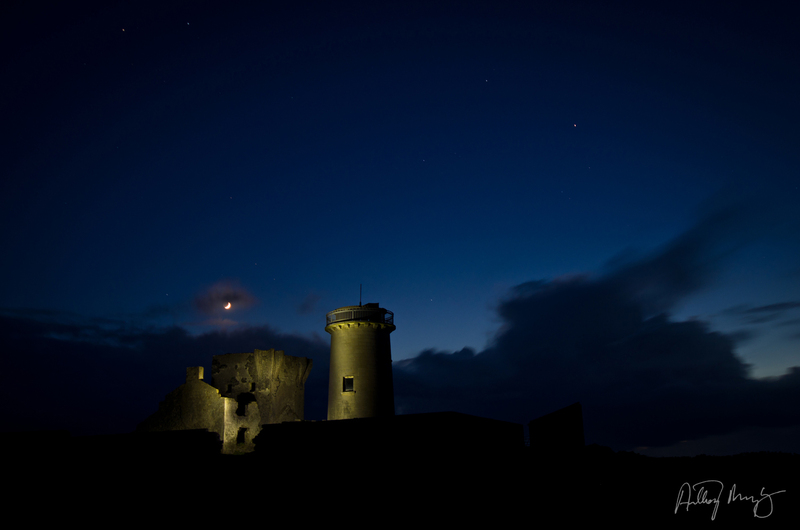 "I’ve seen lots of lunar eclipses over the years and I’ve always found them very fascinating to watch," said David Moore, Editor of Astronomy Ireland magazine. "This Friday is a great opportunity for people all over Ireland to go out and see an eclipse for themselves. The best thing is to look at the Moon before the eclipse starts, so you can see how much darker it gets as the night goes on." "We want people to send in their observation reports and photos for publication in our magazine. Email them to observe@astronomy.ie," said Mr Moore. I have the distinction and pleasure of being the latest guest author to be interviewed for the Ancient Origins website. The interview was conducted by April Holloway and was done via Skype. Have a look at the video above for some insights into Newgrange, including the extraordinary tale recorded there in the mid 20th century relating to an event that was first witnessed at this monument in deep prehistory. The biggest and most expensive spacecraft ever put into orbit around Earth will pass in front of the Moon as viewed by people along a line from Dublin to Bantry, Co Cork, tonight. See map at bottom of this post. 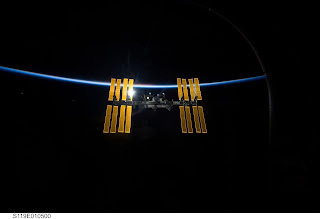 At 8:54pm (Thursday, October 10th) the International Space Station will rise in the west and blaze through the sky towards the Moon in a spectacular sight. Astronomy Ireland urges everyone to go out and see the spectacle. "The ISS will almost look as if it will crash into the Moon, but of course this won’t happen, as the Moon is about a thousand times further away than the space station," said David Moore, Editor of Astronomy Ireland magazine. 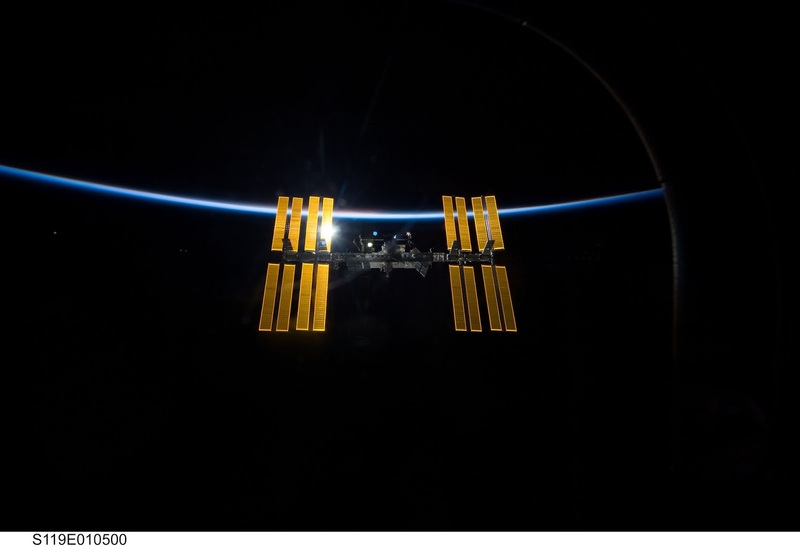 "However, if you imagine a line drawn from Dublin to Bantry Bay in Cork, people along that line – or within 16km either side of it - can look up and see the ISS pass in front of the Moon. This is a very rare event and we want everyone who can to go out and see it!" "Because this is so rare, we want people to send in their observation reports and photos for publication in our magazine. Email them to observe@astronomy.ie," said Mr Moore. 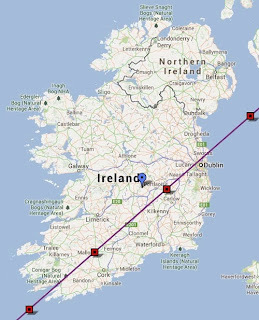 A map of Ireland showing where people can view the International Space Station pass in front of the Moon can be found below. 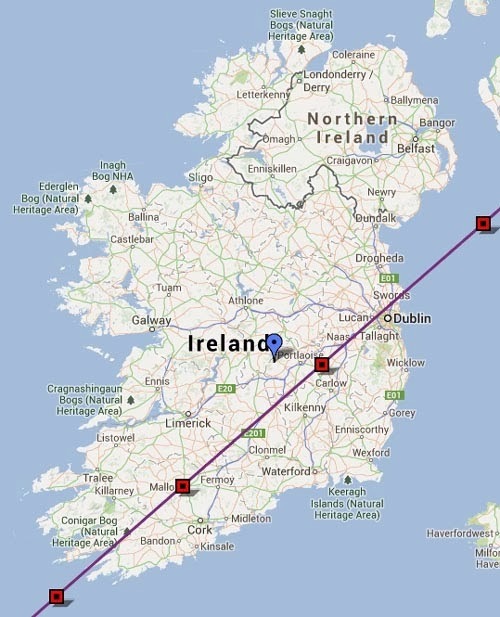 The ISS will continue to pass over Ireland every evening until October 26th, and the times it will be visible will be posted online at www.astronomy.ie/iss each afternoon. I'm amazed that this beautiful video showing the solstice sunlight in the chamber of Newgrange hasn't had more views on YouTube. Currently, it only has 112 views. This is the sort of video that is extremely rare, because it's so difficult to get into Newgrange on the solstice and usually only the press photographers are allowed in, and they don't usually do video. This video puts you right in the chamber, at that special moment. There are some shots closer to the entrance too. Really beautiful stuff. Well worth a look. Two photos of Newgrange taken last night, on a beautiful October evening, with Ursa Major (The Plough) hanging in the northern sky above the monument. Two of the ancient names of Newgrange are represented, Síd in Broga and Brug Mac Ind Oc. The name Newgrange was given to the monument in the 12th century by the Cistercian order, who had established the nearby Mellifont Abbey and come into ownership of all the lands down to the Boyne. The name the 'New Grange' was given to the field which contained the monument previously known by various names, including the above. That's the name by which we know it today, but it is a relatively modern sobriquet !!! In the meantime, above is another wallpaper with a quote from LOTELO. Feel free to share and download. 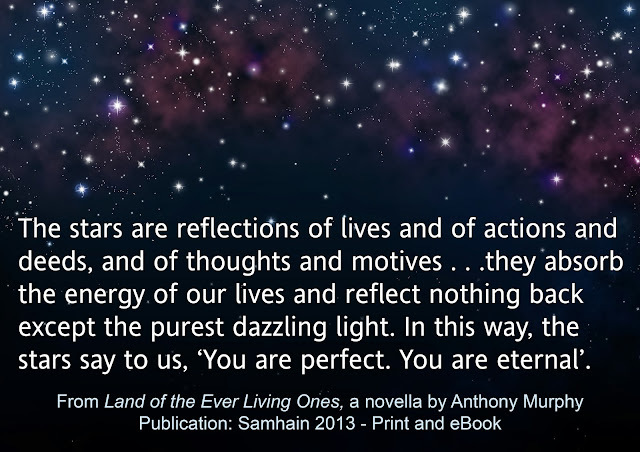 Labels: Anthony Murphy, book, desktop, eBook, fiction, Land of the Ever-Living Ones, novel, novella, publish, quote, screensaver, wallpaper. I am taking a giant leap into the realm of fiction! 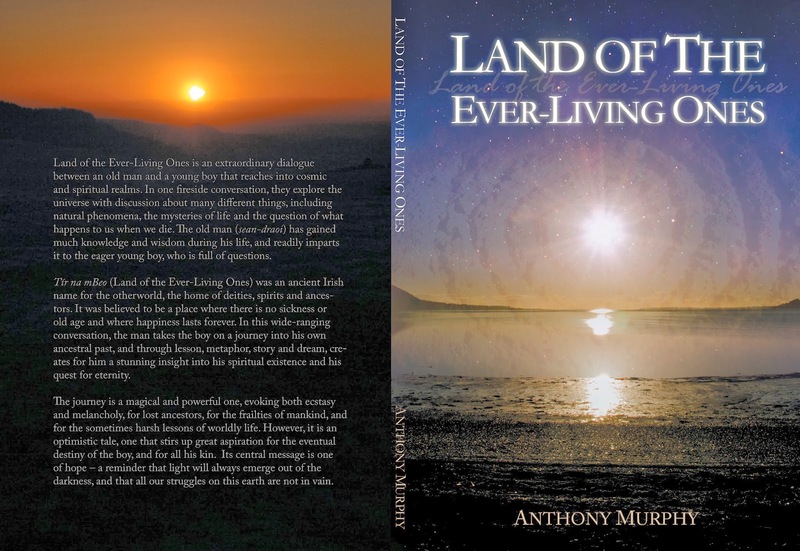 My first work of fiction, a novella called 'Land of the Ever Living Ones', is nearing completion. The text is finished, and is currently being edited. I am planning to publish the book at Samhain, and if all goes to plan there will be both a printed version and an eBook version. Land of the Ever Living Ones is an extraordinary dialogue between an old man and a young boy that reaches into cosmic and spiritual realms. In one fireside conversation, they sweep the universe with discussion about many different things, including natural phenomena, the mysteries of life and the question of what happens to us when we die. The old man (seandraoí) has gained much knowledge and wisdom during his life, and readily imparts it to the eager young boy, who is full of questions. Tír na mBeo (Land of the Ever Living Ones) was an ancient Irish name for the otherworld, the place to which the soul was believed to have gone after death. In this wide-ranging conversation, the man takes the boy on a journey into his own ancestral past, and through lesson, metaphor, story and dream, creates for him a stunning insight into his spiritual existence and his quest for eternity. The journey is a magical and powerful one, evoking both ecstasy and melancholy, for lost ancestors, for the frailties of mankind, and for the sometimes harsh lessons of worldly life. However, it is an optimistic tale, one that stirs up great hope for the eventual destiny of the boy, and for all his kin. Its central message is one of hope – that there is some reward beyond this life, and that all our struggles on this earth are not in vain. Author and jewellery maker Jack Roberts, who is well known as being the co-discoverer of the equinox alignment of Cairn T, Loughcrew, with Martin Brennan, has just published a new book about stone circles. It's called 'The Sun Circles of Ancient Ireland' and is available in all good bookshops now. In this interview with Anthony Murphy of Mythical Ireland, Jack speaks about how he came to be interested in stone monuments and stone circles in particular. 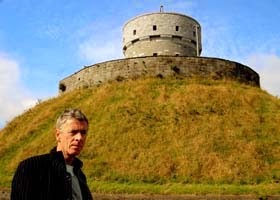 He also speaks candidly about his friendship with Martin Brennan, who he describes as his "guru" and "teacher", and about the controversy between Brennan and archaeologists that led to Brennan fleeing Ireland and not returning for a quarter of a century. Roberts was also a good friend of John Michell. 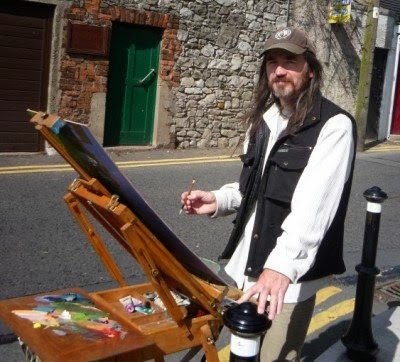 He lives in Sligo, but has spent 30 years on and off studying the stone circles of the south of Ireland. His new book represents the fruits of that labour. While driving on my way out to visit Newgrange, I give some thoughts on Ireland's current emigration statistics and economic stagnation, and how our ancient mythology might echo what has been happening to the country in recent times. This is a short extract of a speech I made at the launch of 'Newgrange: Monument to Immortality' in Drogheda in October 2012. It serves to highlight some of the themes explored in the book, and to explain how the journey of exploration of Newgrange for me was as much a personal and spiritual journey as it was a journalistic one. 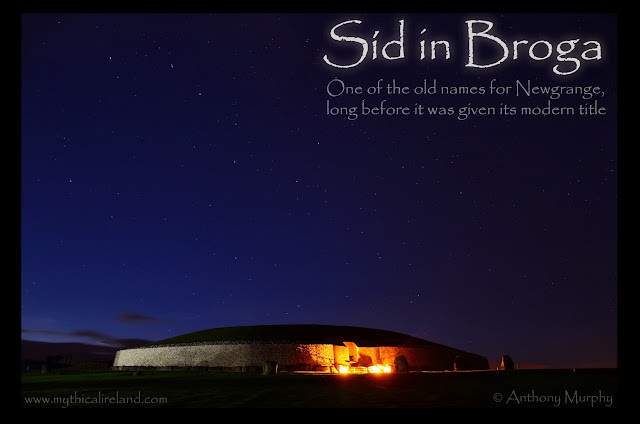 Above is my latest podcast, which this week focuses on the place name 'Bro', also written 'Broe', which is found at Newgrange and in its vicinity. 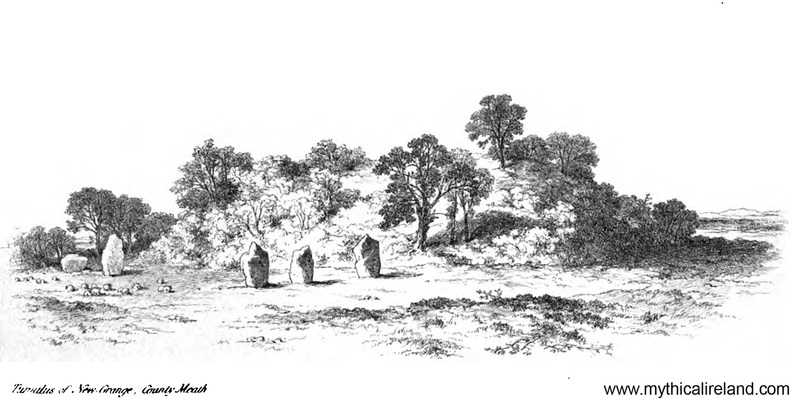 William Borlase, in his 1897 second volume of 'The Dolmens of Ireland', refers to this name and talks about how local people at the time pointed out that the field in which Newgrange sits was called 'Bro Park', or Brugh Field. 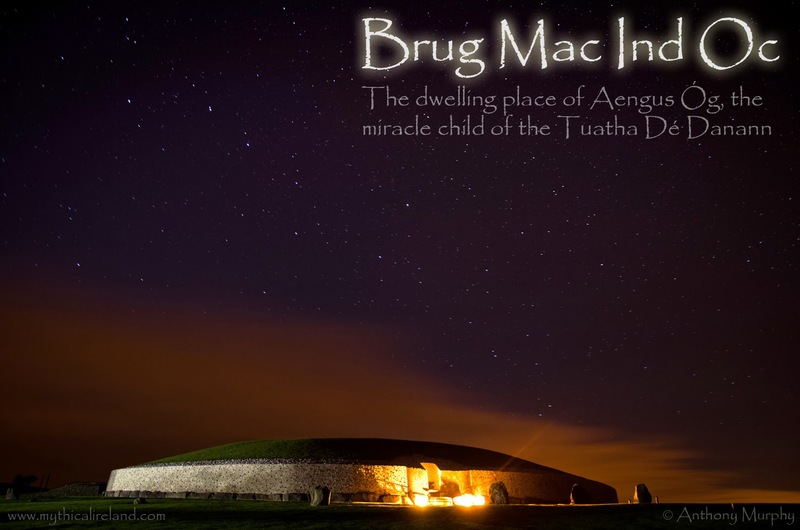 This could relate to the old name of Newgrange, Brú na Bóinne, originally Brug na Bóinne. 1) Add a comment to this blog post. I'd love to hear your feedback. Thanks. 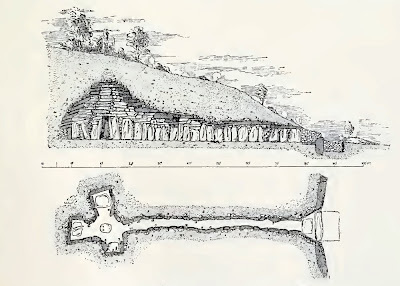 A sketch of the entrance to Newgrange published in 1866. 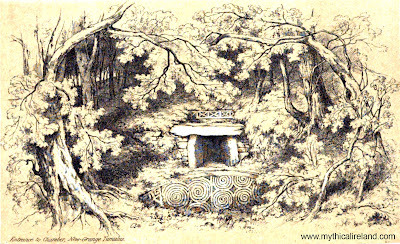 These two drawings of Newgrange are extraordinary. I've never seen them until today. And even though I've written a book about Newgrange and might be considered something of an expert on the monument, I'm pretty sure I've never seen them replicated in any modern book on the subject. I could, of course, be wrong, but certainly I have no memory of ever seeing them before. Which is why seeing them today for the first time has been such a beautifully pleasant surprise. They were published in a book (it's name I will reveal in another blog post soon!) in 1866, and so belong to a time when we weren't exactly sure what Newgrange looked like. We have earlier drawings and paintings, by the likes of Vallancey and Ledwich etc., and then photographs from the late 19th century onwards. 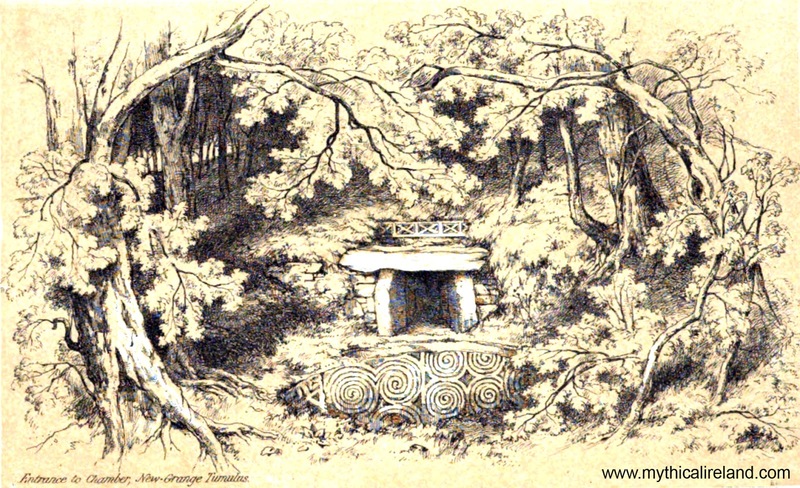 Here is a unique moment in the Newgrange timeline. The mound is considerably overgrown with trees. In fact, they almost smother the entrance. There is something extraordinarily romantic and evocative about the above drawing. Views similar to the one below have been seen before, but I've never seen an early drawing or sketch from that particular angle. Again, I think that this might be a unique image, having not seen the light of day in modern times. I am, of course, open to correction, and if anyone can put me right, please do! I would be very interested in hearing from anybody who might have seen the first two images before. I have checked any books about Newgrange here in my own library and am pretty sure that it is not featured in any of those. 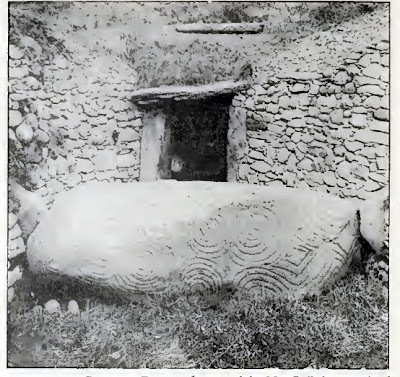 The entrance of Newgrange as it looked before the 1960s excavation and renovation, but long after the entrance had been rediscovered by Charles Campbell's labourers in 1699. 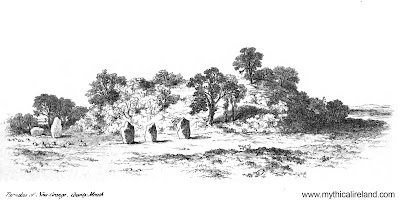 Featured in George Coffey's RIA paper and reproduced in William C. Borlase's Dolmens of Ireland (Vol II). A section and plan of the passage and chamber of Newgrange by George Coffey. Is Millmount really a passage-tomb? 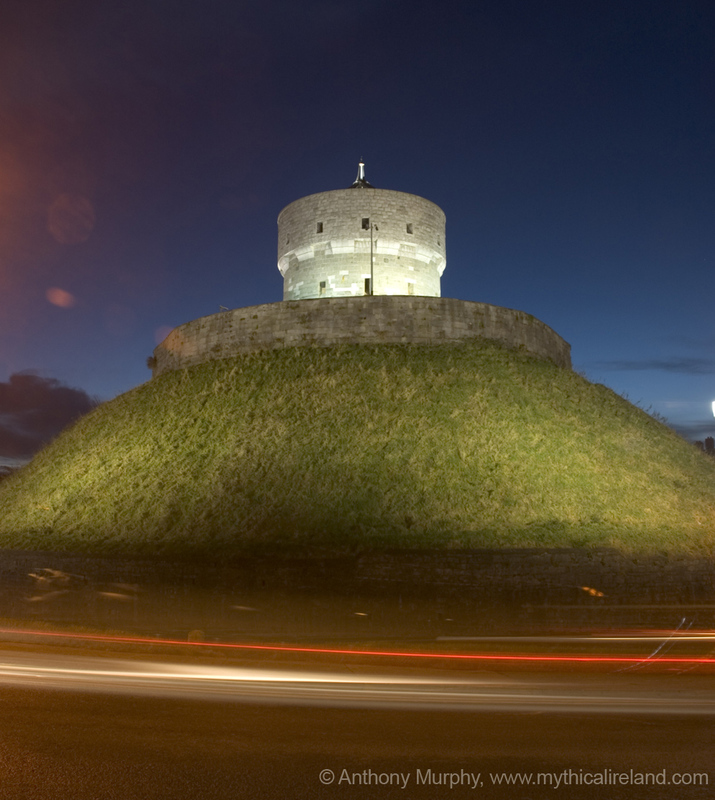 It is thought that the mound at Millmount in Drogheda was originally part of the great Megalithic (“large stone”) Culture which flourished in the Boyne Valley from 5,000BCE to 2,000BCE and includes the internationally-famous tombs of Newgrange and Knowth. Its importance in our collective folk memory is underlined by the legend that the mythological figure Amhairgin (pronounced “Aver-gin”) the originator of song and poetry is buried there. 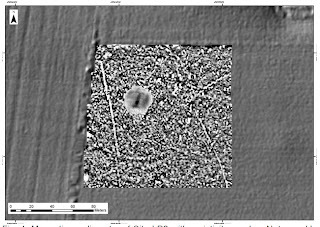 Because of the huge amount of structural changes on the mound over the millennia normal archaeological excavation is impossible but now through the wonders of modern electronic remote sensing (“geophys”) we can scan deep into Millmount and begin to unlock its secrets. Leaders of the Project Team, Kevin Barton of Landscape & Geophysical Services and Conor Brady, Lecturer in Archaeology at DKIT will launch the research programme with a special lecture in The Governor’s House Millmount on Thursday 22 Aug 2013 at 8pm. In Early Irish mythology Amhairgin ("aver-gin") was the inventor of song and poetry as implied in his name ("Amhair"=singing; "gin" = give birth to). The extraordinary poem/song associated with him, Duan Amhairgine (The Song of Amhairgin), was therefore regarded by the Old Irish as the first song ever made and was always placed first in collections of poetry. Many composers and songwriters have also set versions of the text to music including this one in the original Old Irish by Lisa Gerrard (of Dead Can Dance) from the BBC series "The Celts". This new star in Delphinus has been Nova Delphini 2013. Click image for large version. This is a quick shot of the new nova in the constellation Delphinus which I shot from the front driveway a few minutes ago between gaps in the clouds. The "star" (it's really an exploding star) is easy to spot in this four-second exposure which was taken with my Nikon D7000. Read more about the nova here. The first passage-tomb to be discovered in the Boyne Valley in 200 years has been identified by archaeologists using sophisticated imaging techniques. Archaeological imaging and geophysics specialist Kevin Barton spoke about the discovery, made originally in 2010, at a recent Heritage Week presentation at the JFK Arboretum in County Wexford. He was giving a talk about possible new monuments discovered in LiDAR (Light Detection And Ranging) imaging of the Great Island area of Wexford. 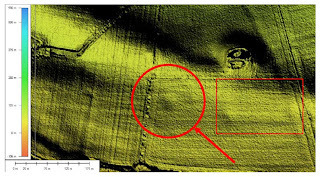 The “new” passage-tomb, on the floodplain of the Boyne southwest of Newgrange, had showed up as a “blip” on LiDAR imagery of the valley, Mr. Barton said. Because of its situation in proximity to the Boyne monuments, it was considered that the feature warranted further investigation. The site was given the designation “LP2” by investigating archaeologists. In the LiDAR image it appeared there was a central mound with a circular outer enclosure feature. The enclosure was “faint but identifiable” in the image. 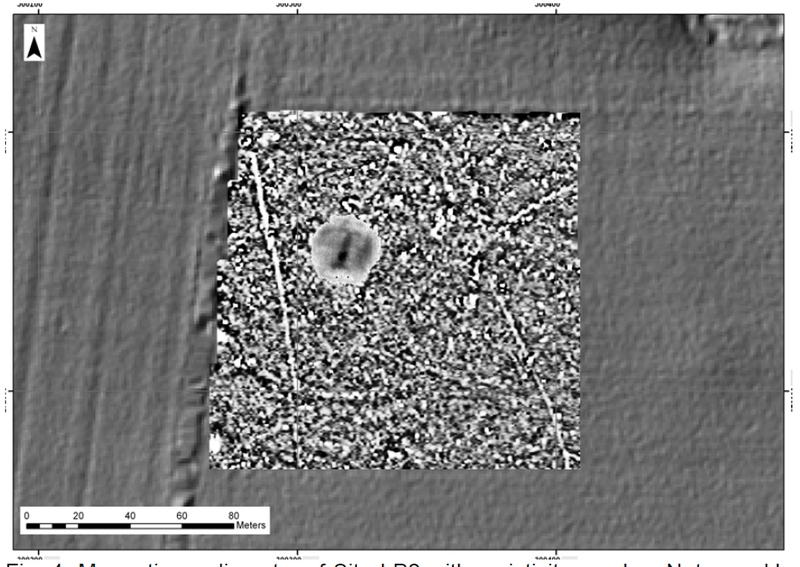 Further work, in the form of ground-probing techniques called Magnetic Gradiometry and Resistivity was carried out, and revealed what appeared to be a weakly defined outer enclosure in addition to a distinct passage/chamber arrangement of the passage-tomb aligned towards the north-northeast. techniques at the JFK Arboretum. © Anthony Murphy. Kevin Barton told the audience at his Co. Wexford talk that he believed it was the first passage-tomb to be discovered in the Brú na Bóinne complex in over 200 years. What makes the discovery very special is the fact that no archaeological digging took place to find it. It was discovered purely through LiDAR imaging and ground-probing techniques. The area where the passage-tomb is located is close to the Boyne, straddling a modern hedgerow. The land has been under tillage and pasture at various times, and has probably been considerably ploughed over the years. 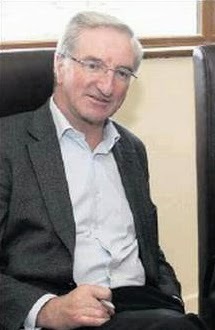 Commenting on the discovery, Anthony Murphy, author of Newgrange: Monument to Immortality said that it was just one of a number of exciting new features identified over the past few years in the Boyne Valley. Landscapes Project. Source of data: Meath County Council/Discovery Project. “I am particularly excited by the suggestion that the passage of this newly-discovered monument may point towards the north-northwest. If that’s the case, there are two possibilities which I’d like to see examined. One is that the passage points back up the slopes of the valley towards Newgrange. The second is that, because it points to the north-northwest, it cannot be aligned on a sunrise or moonrise, and one could propose a stellar alignment," Mr. Murphy said. But this newly-discovered monument might never be excavated. Kevin Barton said in his talk that archaeological digging is not only invasive, but destructive. The new electronic arsenal employed by archaeologists is, however, providing the means to look under the soil without ever having to dig. And Mr. Barton said the equipment and the analysis of data were improving all the time. The new breakthrough is a testament to the exciting prospects of discovery in future of monuments that are currently hidden from view in the landscape. Some of these new techniques have been employed at the Hill of Slane, where a mound, also surrounded by a circular enclosure, is thought by some to have originally been a passage-tomb, possibly as old as Newgrange, which was later re-fashioned by the Normans into a defensive motte. 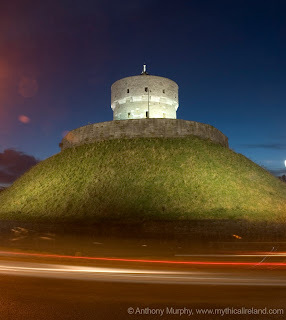 Some new techniques will also be employed to examine the possibility that Millmount, in Drogheda, is also an ancient passage-tomb which was re-used by the Normans and later by the British who fortified the mound with a martello tower on top. Acknowledgements: Steve Davis, Conor Brady, Kevin Barton and Will Megarry (archaeology); funded by the Heritage Council (INSTAR); Meath County Council (LiDAR imagery); the archaeologists are very grateful to the Redhouse family for access to the land. Boyne Valley Landscapes Project: Steve Davis, William Megarry. Conor Brady, Helen Lewis, Thomas Cummins, Loreto Guinan, Jonathan Turner, Colman Gallagher, Tony Brown and Robert Meehan. See Boyne Valley Landscapes Project Phase III Summary Report and Phase III Final Report. This is a short video featuring an account of the 'good people' of Newgrange, or the fairies as they were known, as related to W.Y. Evans Wentz for his 1911 book 'The Fairy Faith in the Celtic Countries'. 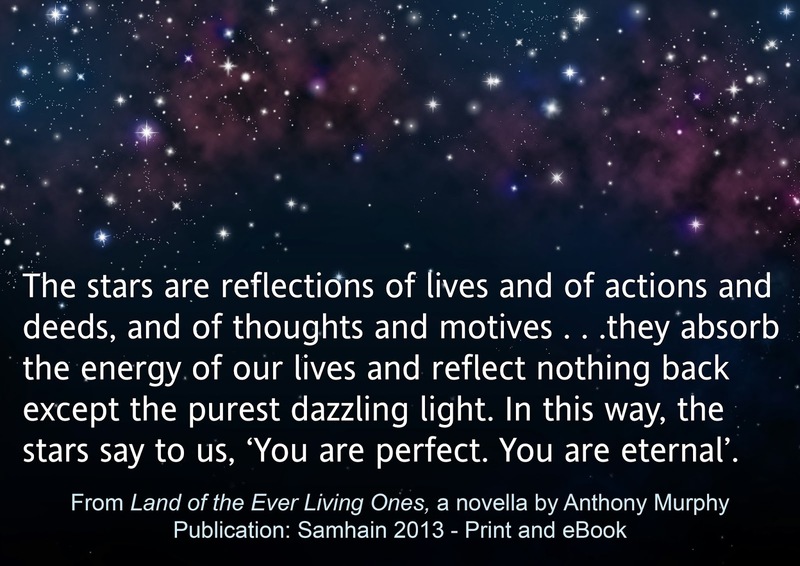 Read by Anthony Murphy. In 2009, after having thought about it for a long time, I decided to try to get Martin Brennan back to Ireland. The author of 'The Boyne Valley Vision' and 'The Stones of Time', who had made major discoveries about Neolithic astronomy, had left Ireland under a cloud in the mid 1980s and had never returned. With tremendous effort, and with considerable help from some of his friends, the whole thing came together as the 'Boyne Valley Revision' conference, at which he was due to be the star attraction. The event was held at the Newgrange Lodge on the day before winter solstice. Martin was very grateful at being brought back to Ireland, and indeed he met many old friends, and made lots of new ones too. It's the only time he's been back in a quarter of a century. I've decided to put his whole talk online. I think it will serve as a valuable historical record, and it also gives some insights into some of the work he is doing in Mexico, where he has been living for a number of years now. His visit brought a lot of healing, and some of the acrimony between the Brennan 'camp' and the archaeologists was consigned to history. Brennan was one of a number of people who inspired me when I began a wonderful adventure in the Boyne Valley with Richard Moore in 1999, which culminated eight years later with the publication of 'Island of the Setting Sun'. It was a great pleasure not only to meet him, but to spend time with him, and to become his friend. We don't, of course, agree on everything that each of us has written, but we have a common bond through our researches and writings that made us instant friends. I will never forget the history few days when he came back to the Boyne Valley. Also speaking that day were Jack Roberts, Toby Hall, Sig Lonegren and Chris Bruno, all good friends of Martin's. 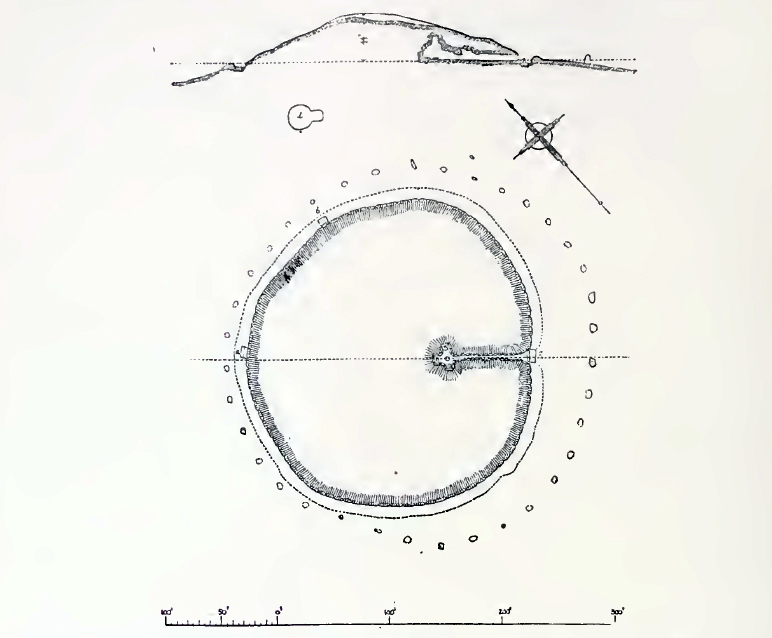 Indeed Jack Roberts was with Brennan when they discovered the Dowth South solstice alignment and the penetration of dawn's glorious light into the chamber of Cairn T at Loughcrew on the equinox. I hope that you enjoy Martin's talk. He is a wonderful speaker. As an artist, he does all of his own drawings and illustrations, which are superb. He manages to make very interesting links between ancient Mexican culture and the Boyne monuments which is fascinating. I was delighted to be the guest speaker yesterday at the annual Mulvihill Clan reunion, held at the O'Callaghan Alexander Hotel in Dublin. I gave a talk about Newgrange and Ireland's ancient astronomers to a small but interested group of Clan members from various parts of the United States. Perhaps the most interesting aspect of the afternoon was how the questions session at the end of the talk developed into a conversation about the current state of Ireland and how the myths and monuments could contribute to our understanding of the crisis and perhaps to our recovery from it. Danann are said to have retreated after the Milesian invasion. I said that part of the reason that sacred places like Newgrange have become so popular relates to the void in people's lives associated the problems of living in modern Ireland. There is a crisis in the church, in politics, and in the banking system. In short, I said that Irish people had been dispossessed of their traditional spiritual beliefs, and their faith in the political system. But most importantly, many people had been dispossessed of the power to govern and finance their own lives. I suggested that, once you lose that power, the political system ceases to have any relevance or hope for you. If you take away a person's power to earn a living, and to own a property, and to raise a family in comfort and dignity, then you have taken everything away from them, and you leave a void that cannot be filled. Politics ceases to have anything to offer. But, not to sound like the whole affair was one of despair, we discussed how there was something that could be learned from our ancient myths and sacred sites. For instance, our invasion mythology relates how the Tuatha Dé Danann willingly "gave" the country to the Milesians. Without any significant war or major battle taking place (there were some skirmishes, according to myth, but nothing along the lines of the Battles of Moytura with the Fomorians) the Tuatha Dé agreed to hand over Ireland to the Milesians, while they (the gods) retreated into the sídhe, the mounds, where they would live on in the otherworld. Like the Tuatha Dé Danann, we have ceded power and sovereignty to foreign interests (also from Europe). But the question is, do we have the power to return to proper self governance, with our own integrity, and maintaining control of our sovereignty? The folklore of the Tuatha Dé is full of prophecy about their return. They will come back, so say the legends, at some future time of great strife, to help Ireland at a time of great need. They will come thronging from the sídhe, racing back from the otherworld for a marvellous battle. And it’s a battle that they will win, restoring glory to Éire once again. So says the folklore. I am of the view that the Tuatha Dé Danann represent aspects of our psyche, our consciousness as a people, that deepest part of who we are and what we hold to be dear. We are hurting as a people right now because we have been forced by circumstances to retreat from normal life and to find shelter in the sídhe. We are not designed to live in caves, whether they be physical or metaphorical. And we can only go to the otherworld when we die. While we are still alive, we wish to have the power to influence the sort of lives that we lead. I told the clan gathering that one of the most painful things for any Irish person was the specture of eviction - to be dispossessed of one’s own home. We are facing the possibility of a wave of evictions as a result of changes in legislation which allows banks to put more pressure on families struggling to pay mortgages. Are we going to find ourselves in the same situation as the Tuatha Dé Danann? Are we going to be forced to retreat from our lives into some cave? What practical support does mythology, or indeed a sacred site like Newgrange, offer us, apart from some idealistic notion? People are trying to reconnect with the past. That might be due, in part, to some romantic notion that somehow life was better back then, less complicated. It’s called “numenism”. We find ourselves enraptured by a visit to an ancient sacred monument, and we imagine that life must have been blissful and ecstatic for the people who built it. 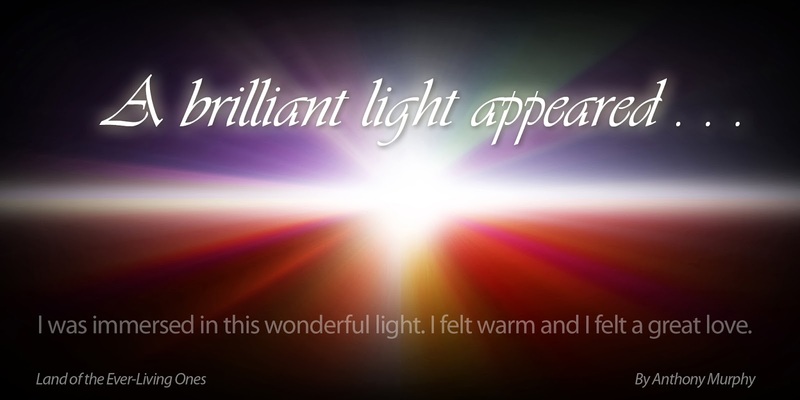 We wish for that same bliss to encompass our own lives. Is that such an unhealthy thing to do? Is it altogether futile to go to Newgrange, or the Hill of Tara, or any one of a thousand ancient sites in Ireland, and to imagine that we can share in some magic which we associate with that site? Personally, I don’t think hope is a futile exercise. As Andy Dufresne said in Shawshank Redemption: “Hope is a good thing, maybe the best of things, and no good thing ever dies’. The rising interest in ancient monuments might also be because we see in Newgrange a monumental declaration of a people’s place in the world, an edifice that describes a time when people were united in spiritual belief. More important, in my opinion, is the fact that Newgrange represented the grand expression of a “cosmic vision”, one that saw our existence as being at one with the world and the universe. Right now, we are calling on the Tuatha Dé Danann to return. And that’s because we are the Tuatha Dé Danann. They represent a magical and empowering aspect of ourselves, an attribute of Irish people that has become dormant time and time again during the long years when we found ourselves under occupation. It seemed that when we were invaded literally, we behaved as the invasion myths describe – we metaphorically retreated into our caves. Deep down, do we not possess the magical powers of the Dagda, and Manannan, and Bóinn, and Aongus, and Lug Samildánach, and the host of the Tuatha Dé? Do we not yet possess the power to call them back from the sídhe to help us? Above is a short video showing you the basics of the National Monuments Service online interactive map of all known recorded monuments in Ireland. It is an extremely handy and useful resource and one which is relatively easy to use. The video is a short introduction to finding information about a site or monument in your locality. Labels: ancient, interative, Ireland, location, map, monuments, National, online, site, video, webgis. Professor George Eogan, who excavated the megalithic passage-tomb at Knowth for more than four decades, speaks about discovering the passageways and shares some of his memories of working on the site. Labels: archaeologist, excavations, George Eogan, Knowth, professor, video. The skies over Ireland will be lit up this weekend with the best Meteor Shower of the year, with the peak occurring on Monday night. 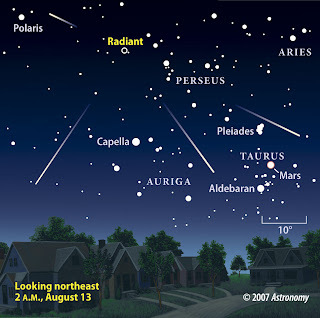 Called the Perseids, they are known for producing more fireballs than any other meteor shower during the year. will appear to emanate. © Astronomy. Counting the numbers of meteors seen is vitally important to monitor the long term development of this shower, so Astronomy Ireland is organising a Nationwide Perseid Watch. All you have to do is count how many meteors you see every 15 minutes and report it on the society’s website (astronomy.ie) where you can also find further details. 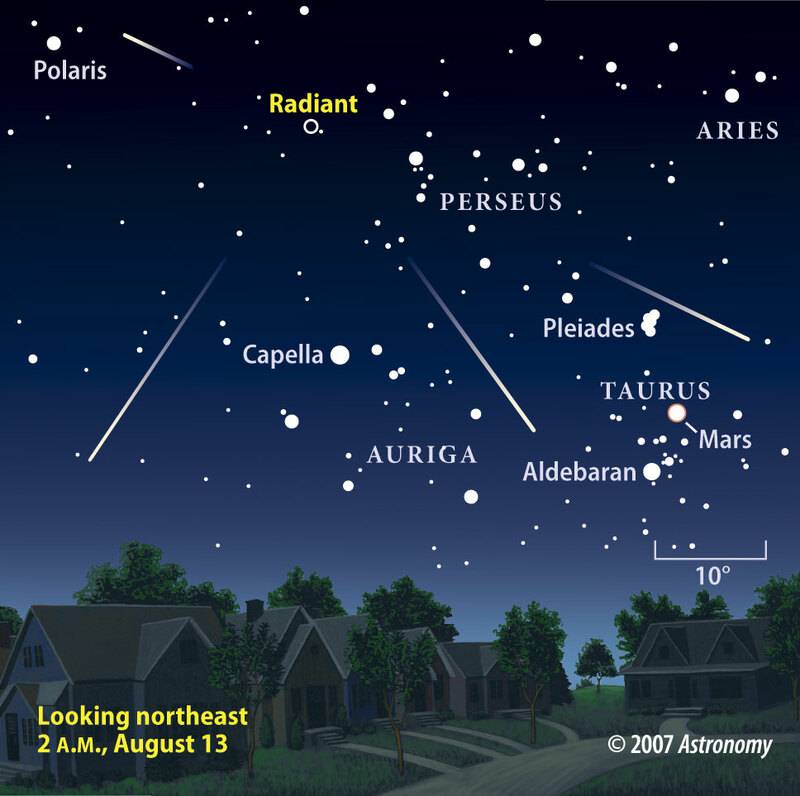 No telescopes or binoculars are needed to see the Perseids as they are bright enough to be seen with the naked eye. "The Moon will be out of the way so it is definitely worth going outside to try to see some bright Perseids," said David Moore, editor of Astronomy Ireland magazine. "Sometimes large pieces of debris enter the atmosphere and flare up extremely brightly as fireballs - these can often land on the ground! We want everyone to go outside every night over the weekend and take part in our Nationwide Meteor Watch"
Astronomy Ireland urges people to go outside this weekend and next week to observe the meteors to take part in the Nationwide Meteor Watch. By doing so, people all over Ireland can take part in real scientific research! For more information on the Perseid Meteor Shower and how to take part in the Nationwide Meteor Watch please visit www.astronomy.ie. Some of these reports will then be published in Astronomy Ireland magazine in the coming months. 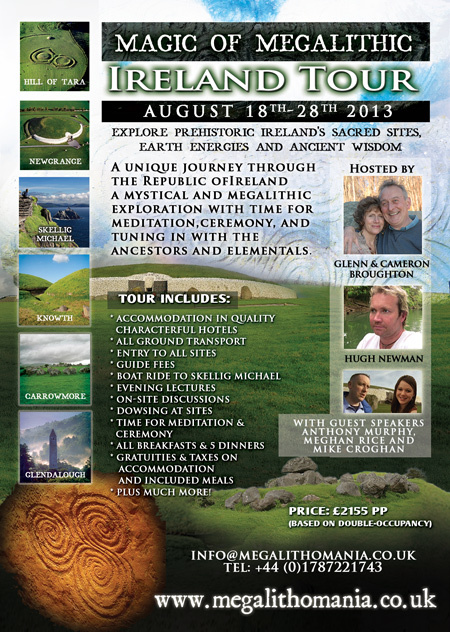 I'm very happy to be giving a talk to the Magic of Megalithic Ireland Tour this month. The tour will be vising Newgrange and Knowth, where I will be giving them some insights into the cosmology and mythology of these wonderful stone age monuments. The tour is being hosted by Glenn and Cameron Broughton, who have travelled the world investigating ancient sites, and Hugh Newman, who is organiser of the annual Megalithomania conference. I will be telling this group all about the astronomical alignments of the sites, plus the long alignments with other sites, as well as the links between the mythology of the monuments and the astronomy. Ever wondered what the inside of Dowth looks like? This is one of the most interesting and useful videos relating to the Boyne Valley that I've seen in a long time. It's a fly-through tour of Dowth's northern and southern chambers based on laser scanning and gives you a real sense of what it's like inside. The survey work was carried out by David Strange-Walker of Trent & Peak Archaeology and Marcus Abbott of ArcHeritage. Thanks to Dr Steve Davis of University College Dublin, and the Office of Public Works, Ireland, for funding this project. I was inside Dowth's northern chamber a number of years ago. I visited with a group, and we accessed this chamber through the souterrain, just as shown in this video. The imagery is from real scans, and is therefore incredibly accurate. Those of you who have visited Dowth for the sunset at winter solstice might be familiar with the interior of the southern chamber, which is the shorter, circular chamber. However, the northern chamber is completely off bounds to the public - at least those who might never get the chance to go inside it can now do so virtually. Fantastic stuff. The history books really do need re-writing! I just read my daughter's history book. She's starting secondary school later this month. 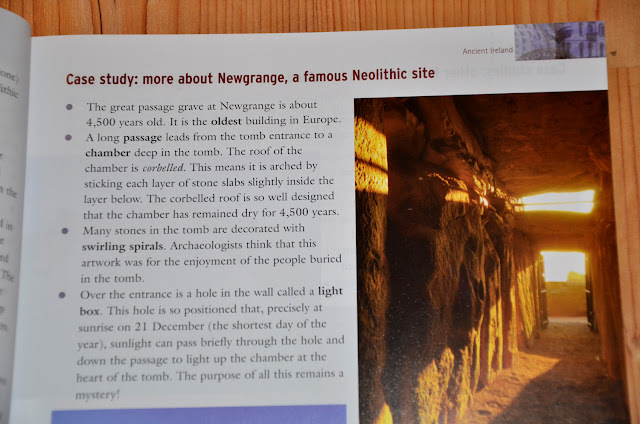 Under the section about ancient Ireland, I was interested to read about Newgrange. There are no less than two factual errors in the first sentence. First of all, Newgrange is NOT 4,500 years old, as claimed. A cursory web search will reveal that it is, in fact, over 5,000 years old. The second statement is that Newgrange is the "oldest bulding in Europe". What utter nonsense. In fact, its sisters, Knowth and Dowth, are older. But there are far older structures than Newgrange in Europe. What's most annoying about this is the fact that this is not advanced or specialist knowledge. Admittedly, I have a long-standing interest in Newgrange and know a lot about it. However, you don't need a doctorate to know that Newgrange is over 5,000 years old. Where did the author of this book get this figure of 4,500 years from? And upon what research does he base his claim that it is the oldest building in Europe? If this is what we are teaching our children, and our young adults, about the history of our own country, and we get it wrong, what else are we teaching them that is either factually incorrect or totally incongruous? I just Googled the question "How old is Newgrange?" and the first result tells me that it was built in 3200BC. Looks like some of these school books need to be re-written . . .
Glas-Guineach.—This cow was remarkable for giving a large quantity of milk. She belonged to the monks then residing at Kilmalckedor, was well fed and grazed upon the best patches of sweet pasture in the district. A thief attempted to steal her, but was captured in the act. To make an example of him, his finger prints and the impression of the cow’s hoofs for future reference and to warn the people of the district to be aware of him were cut or set into the stones by some natural art touching finger prints then known to these monks. The stories of the Glas-Guineach are numerous and interesting. Children inclined to steal were reminded of what happened to the thief who stole the monk’s cow. Foley, Patrick (1916), Irish Historical Allusions, Curious Customs and Superstitions, County of Kerry, Corkaguiny. This is a slightly different version of the story of the Glas Gablin/Glas Ghoibhneann, related in Island of the Setting Sun. That cow was stolen by Balor, and the story has astronomical implications, which are explored in the book. This is a short film, made at Dowth, about honouring the ancient ancestors. It is set to the beautiful music of Pádraigín Ní Uallacháin, from the album 'Songs of the Scribe'. Above is a short video, featuring the music 'The Land of Stars' by Pádraigín Ní Uallacháin, showing the inaugural Brigid's Way Celtic Pilgrimage from Faughart to Kildare which was launched in July 2013. The pilgrimage was led by Dolores Whelan and Karen Ward, and is based on an alignment of ancient sites discovered by Anthony Murphy and Richard Moore. This alignment, stretching from the sacred well of Brigid at Faughart in County Louth to The Curragh in Kildare. When you stand at the giant amphitheatre-like henge monument near Dowth - the one archaeologists have ingloriously named 'Site Q' - on the morning of summer solstice, the longest day of the year, you will see the sun rising out of the landscape towards the northeast near Castlecoo Hill, at Clogherhead. Site Q has two large openings, one at its south western end, and one at the north east, which both appear to line up towards the solstice sunrise position. Site Q, the giant henge of Dowth. The name Castlecoo comes from Caisleáin Có, meaning the "stone fort of the hound", a possible explanation for which is given in 'Island of the Setting Sun' (2006, 2008 by Richard Moore and I). But another townland name on the hill of Castlecoo has long piqued my interest. That townland is Callystown, which has generally been translated as Baile na gCailleach, the "town of the nuns". Tradition says that there was once a nunnery at Callystown, hence the name. But the issue is not as straightforward as that. The Cailleach was an ancient goddess, revered in prehistoric Ireland in places far and wide. She was known in some places as the Cailleach Bheara / Cally Vera, and although long since reduced to the paltry stature of a "hag" or "crone", it seems that at one time she was a female deity held in very high esteem. Indeed I would draw comparisons between the great Cailleach and goddesses such as Bóann and maybe Brigid, but I will save that for another day. We know that the Cailleach was revered in this region in ancient times. The hills of Loughcrew, upon which sit ancient passage-cairns that are older than Newgrange, Knowth and Dowth, are called Sliabh na Caillighe - the hills of the witch/hag/crone/old woman. She is said to have formed the cairns upon Carnbane East and Carnbane West as she jumped from peak to peak, carrying an apron full of stones, some of which she dropped as she jumped. Curiously, the same story describes the construction of the round tower at Monasterboice in County Louth. According to folk tradition, gathered in the Schools Folklore Collection, the round tower was formed by the Cailleach dropping stones from her apron. In one version of the tale, the Cailleach becomes the Virgin Mary. In another version, she slips from the top of the tower and is killed in the fall to the ground. Not too far away is a stone age wedge tomb called the "Cailleach Bhirra's House". Monasterboice is only six or seven miles west of Clogherhead. I've long wondered if the Callystown area of Clogherhead was perhaps named more anciently than the arrival of the nuns. Richard and I made a strong case in Island of the Setting Sun for a link between the goddess Bóann and the Moon and Milky Way. Similar connections could be made with the Cailleach, who was venerated all over Ireland and whose name survives in many townlands and even on the Beara Peninsula in Cork, along Ireland's southern extremity. Thanks to the widespread availability of historical sources on the internet, it now seems as though I've been able to answer that question, or at the very least to throw some doubt and intrigue on the matter. According to an article on the history of the 'Ancient Parish of Clogher and Kilclogher' on the Clogherhead Development Group website, the nuns arrived in Callystown at the turn of the Sixteenth Century. Writing in 2003, Liam Mac Raghnaill said: "In 1508, a small community of nuns, known as the Black Nuns, arrived at Callystown, where they held 128-acres, a cottage and possibly a small church. They are believed to have moved from Termonfeckin to Callystown as a result of a dispute with the Lord Primate of the time. The convent buildings were thought to have been situated near to the site where Callystown House was later built, but no trace remains." The case would appear to be closed. Clogherhead's Callystown is so called because the Black Nuns lived there from the Sixteenth Century. However, I decided to reference the Online Placename Database of Ireland (Logainm.ie) to see what further information, if any was available, could be gleaned about this place name. 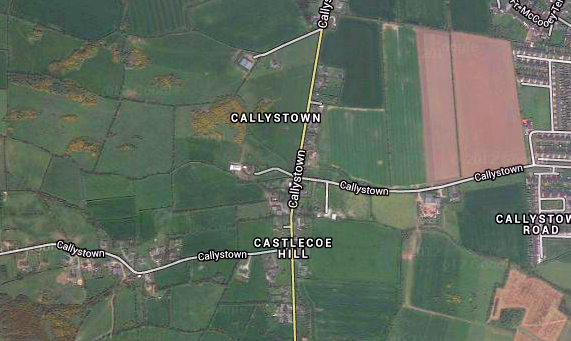 Callystown and Castlecoe Hill on Google Maps. This last spelling, the one immediately preceding the arrival of the nuns, is almost definitely a rendition 'Cailleach' or 'Cailliagh' and 'town'. So there was a nun in Callystown before the nuns! Or, at least, a hag/crone/ancient goddess - call her what you will. Because of the prominent position of Callystown/Castlecoo Hill as a horizon "marker" for summer sunrise from the great Boyne Valley monuments, and because of the very strong association of those monuments and their river valley with the goddess Bóann, it should be possible to at least re-consider the origin of Callystown, and to acknowledge the possibility of another inception for its name. It is, of course, still possible that there was some sort of nunnery or convent at Callystown before the arrival of the Black Nuns. Interestingly, there is a place at nearby Termonfeckin called 'Nunneryland', and we were told the old Irish name for that place was 'Cailleach Dubh', possibly meaning 'Black Nun'. Because Cailleach also means "veiled one", there is a tendency to associate the word with nuns. But as previously stated, the Cailleach is one of Ireland's most ancient divinities. Cailleach Dubh can also refer to the cormorant (a bird), but in her guise as a goddess, the Cailleach Dubh is found even in Scotland. Local tradition in Termonkfecin suggested that there was once an old laneway that ran all the way from Nunneryland to Callystown. Declan Quaile, writing about the old townlands and placenames of the area, said that: "Callystown was always pronounced ‘Calliaghstown’ by the old people, harking back to the original Irish word." Wikipedia has some interesting information about the Cailleach. What might be even more fascinating about the apparent connection between Callystown and the Brú na Bóinne monuments is that the hill doesn't precisely mark sunrise on summer solstice, but is probably a more comfortable fit with the rising of the full moon at the time of its northern extreme. Did the ancient monument builders of the Boyne once upon a time see the full moon rising out of Castlecoo Hill at a significant astronomical moment, and did they then name that sacred hill in honour of the great goddess of creation? We might never know, but we can speculate . . . I was recently interviewed by the Dundalk Democrat (a newspaper of which I used to be Editor) about a giant fireball which had been seen in the night sky over Louth. Although fireballs, which are very bright meteors or shooting stars, are very common, much less common is the occurrence of fragments of a fireball hitting the ground. 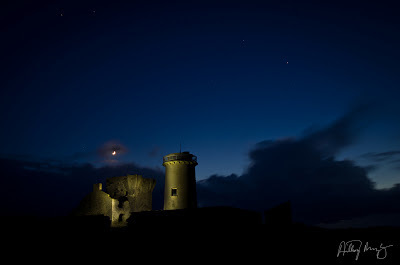 Astronomy Ireland chief David Moore regularly calls upon the public to help provide information about fireball sightings. He is hoping that a precise path of a fireball witnessed over Ireland can be triangulated in the hope that perhaps some fragments did hit the ground and can be recovered. 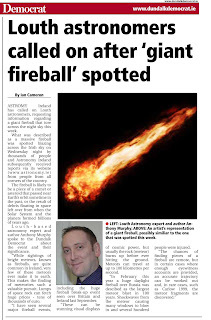 ASTRONOMY Ireland has called on Louth astronomers, requesting information regarding a giant fireball that tore across the night sky this week. What was described as a massive fireball was spotted blazing across the Irish sky on Wednesday night by thousands of people and Astronomy Ireland subsequently received reports via its website (www.astronomy.ie) from people from all corners of the country. The fireball is likely to be a piece of a comet or asteroid that passed near Earth’s orbit sometime in the past, or the result of debris floating in space left over from when the Solar System and the planets formed billions of years ago. Louth-based astronomy expert and author Anthony Murphy spoke to the Dundalk Democrat about the event and its significance. “While sightings of bright meteors, known as fireballs, are quite common in Ireland, very few of these meteors ever make it to earth. This makes the finding of meteorites such a valuable pursuit. Lumps of space rock can fetch huge prices - tens of thousands of euro. “I have seen several major fireball events, including the huge fireball break-up event seen over Britain and Ireland last September. “These can be stunning visual displays of cosmic power, but usually the rock (meteor) burns up before ever hitting the ground. Meteors can travel at up to 100 kilometres per second. “In February this year a huge daylight fireball over Russia was descibed as the largest meteor blast in 100 years. Shockwaves from the meteor caused many windows to blow in and several hundred people were injured. 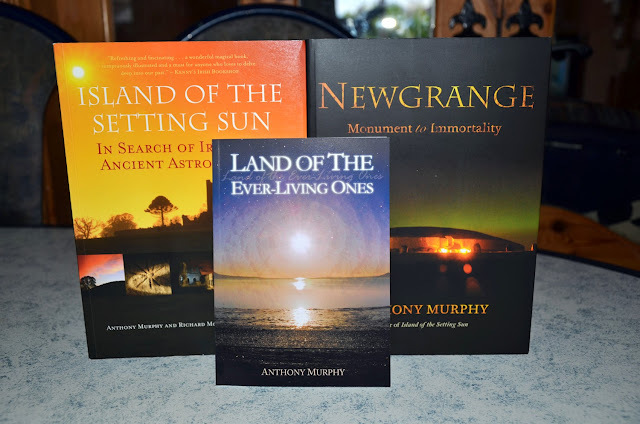 Newgrange – Monument to Immortality (The Liffey Press, pb, €24.95) is the title of a new book by journalist, writer, photographer and amateur astronomer Anthony Murphy. Inspired by the scale and symbolism of Newgrange, Murphy expresses his Newgrange story in an engaging text throughout the book. He states, ‘As long as we have questions about Newgrange, we will continue to explore it, and we will carry on trying to quench our thirst for knowledge’. Readable and interesting, this publication on Newgrange takes us beyond archaeology into some of the more interesting characteristics of the mound that provoke a whole range of reactions from those who get caught in its web of mystique. 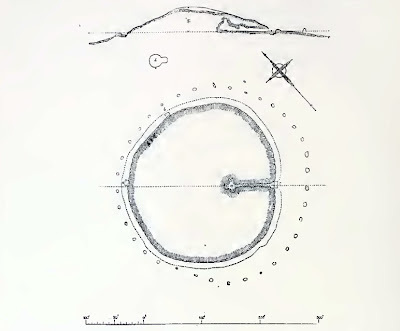 Murphy examines the background to the construction of the great mound and passage tomb, with particular emphasis on the community effort and technical skills that would have been required in its construction. The importance of the celestial movements and the annual cycle of the sun are of particular significance, and several chapters are devoted to this aspect of the tomb’s construction. In subsequent chapters the author explores the ‘womb or tomb?’ theme, drawing attention to the questions concerning the function of such tombs that go beyond burial and disposal of the dead. 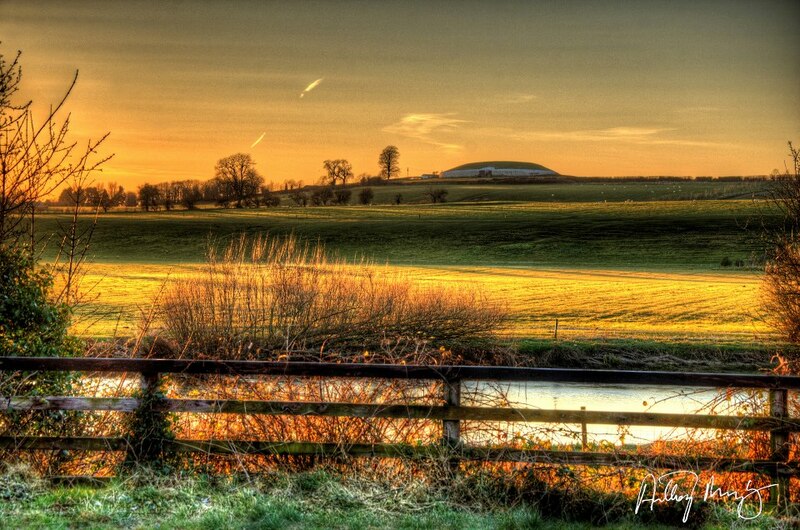 Newgrange is still a meaningful place for modern people, who are attracted to its sense of spirituality. Murphy develops this theme further in discussing the accounts of people who have described their own ‘near death experiences’, where lights at the end of tunnels are commonly reported (the metaphor for death is a strong one when seen in this context!). 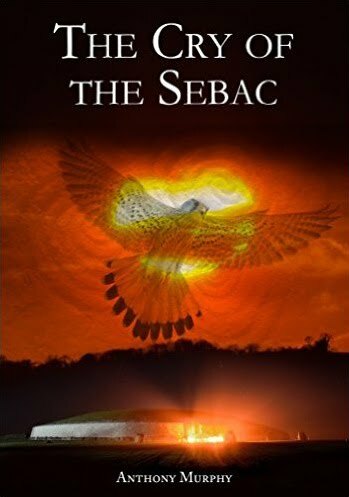 Subsequent chapters on cave myths and the author’s own experience in the tomb at solstice provide an intriguing juxtaposition of ancient accounts from the past and the modern-day reality of visiting the interior of Newgrange. The book itself is beautifully produced and illustrated throughout with high-quality colour images. 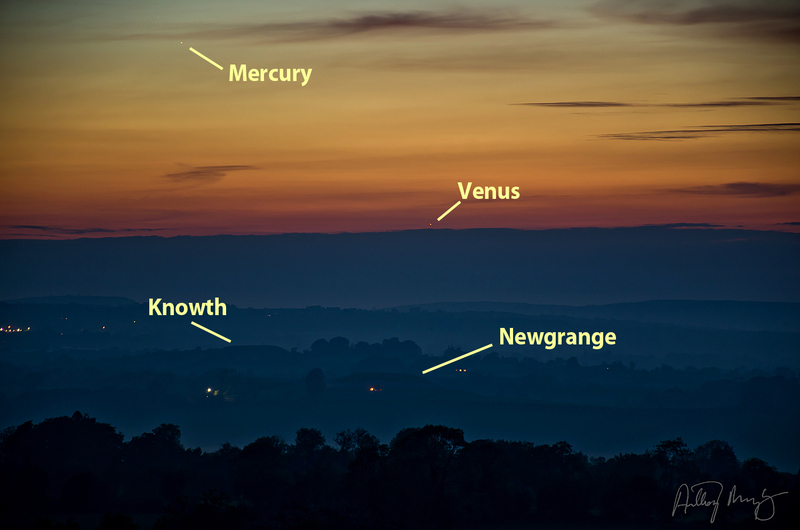 This is tonight's shot of Venus and Mercury over Newgrange and Knowth in the Boyne Valley, taken June 6th. There was a low band of cloud on the northern horizon and you can see Venus is about to set behind it. There was also quite a bit of mist and haze in the valley. 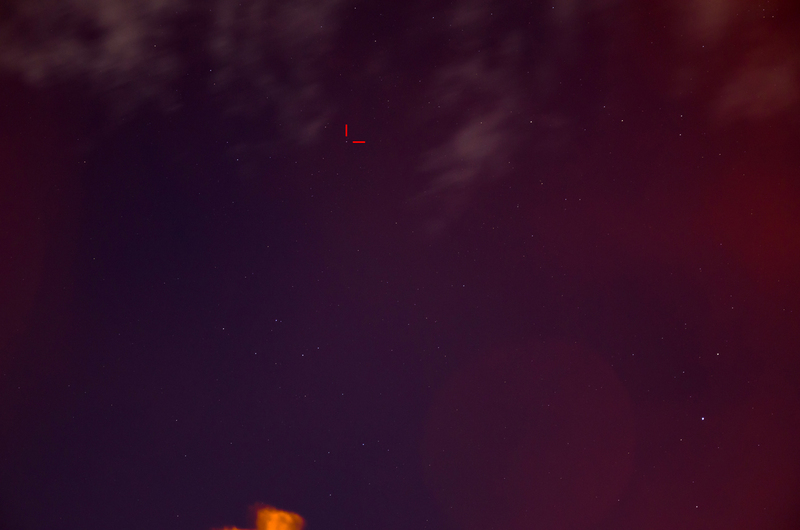 Mercury is near the upper left of the shot. Below is a version of the shot with labels, in case you are not able to pick out Mercury or to differentiate the monuments. 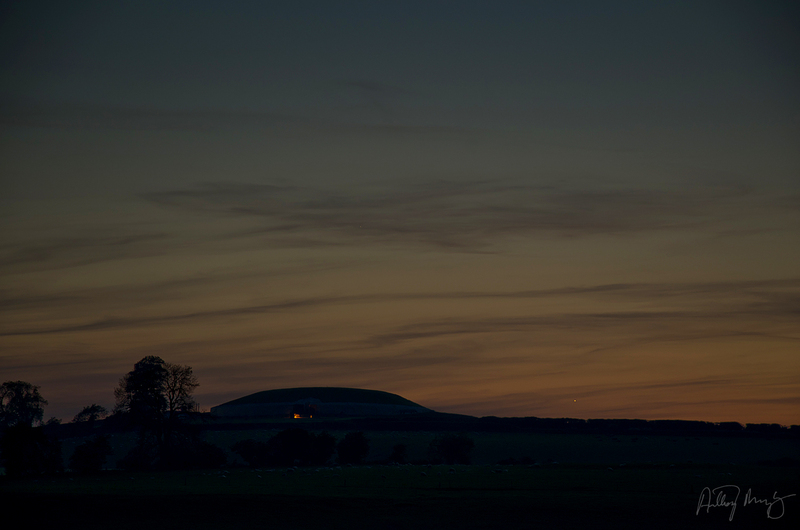 The Evening Star, Venus, setting behind Newgrange. Click image to see larger version. More than 5,000 years ago, the people who built Newgrange peered out into the heavens and watched the movements of the sun, moon, planets and stars. They recorded some of these apparently complex movements on the giant stones which make up their enormous passage-mounds. 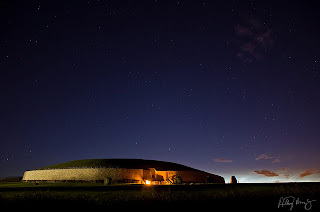 A folk tale about Newgrange says that once in eight years, the morning star (Venus) shines into its chamber on the morning of the winter solstice. The above photo was taken coming up to summer solstice, with Venus on the opposite side of the sky to the winter solstice position. Mercury is also in this picture, higher up, above Newgrange, but is very difficult to see. An eerie mist surrounds the cattle on the fields in front of Newgrange, with Venus to upper right. 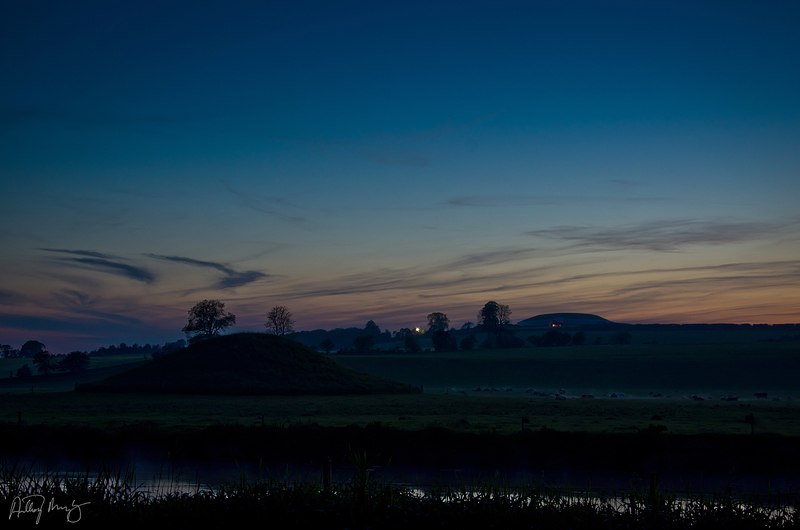 Newgrange and Mound B with mist forming on the Boyne in the afterglow. Labels: astronomy, Boyne Valley, evening star, moon, Newgrange, planets, solstice, summer, sun, Venus, winter. 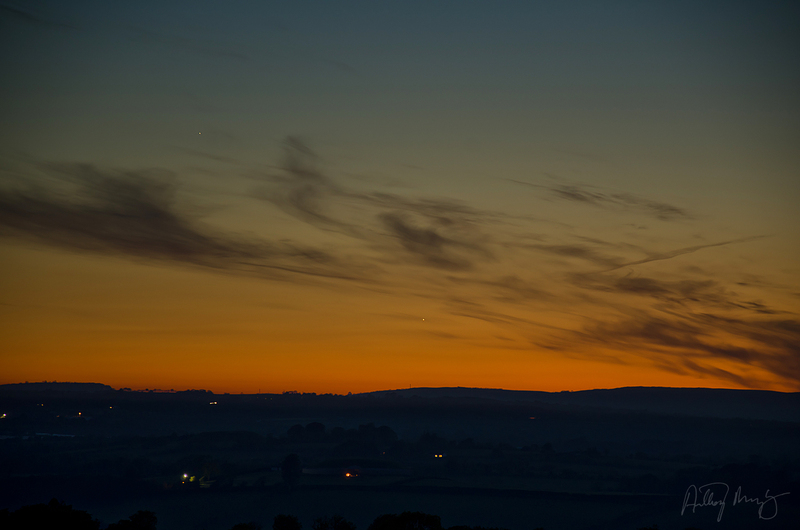 Venus and Mercury in the twilight over Newgrange. Click image to see larger version. 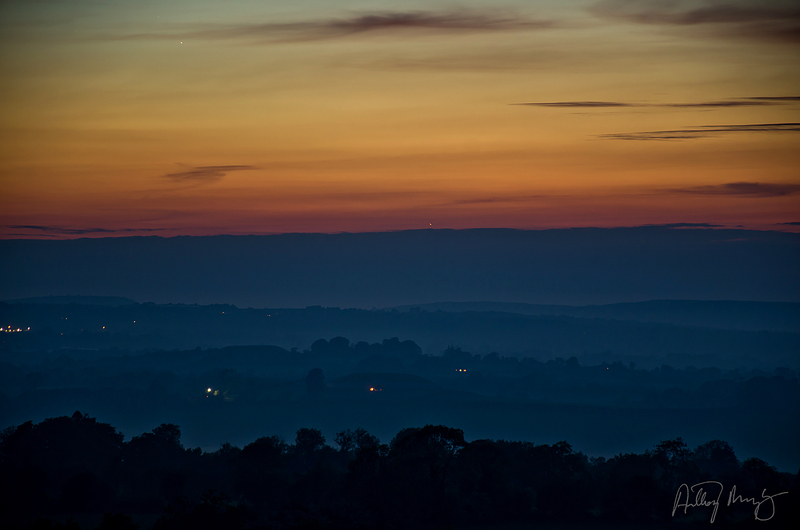 I spent a nice time this evening on Redmountain, across the Boyne Valley from Newgrange, watching for a rare sight. Both Venus and Mercury were visible in the twilight, but with Venus lower to the horizon and Mercury higher up. It was a beautiful June evening, following a glorious warm sunny day here in Ireland. I caught a glimpse of both planets from my home at around 10.30pm and decided to head out into the valley with the camera. It was a fruitful exercise. I first spotted Mercury with the naked eye at 10.55pm, although it had been visible in pictures for at least ten minutes previously. I watched Venus all the way to the horizon, where it set at 11.15pm. I love this time of year, when the twilight stretches right into the night, and the sky doesn't get fully dark. It's such a beautiful time, and reminds us that, despite the short cold days of winter, the long days always come eventually. Summer Solstice is only 17 days away now. Seventeen days and the sun will begin to change its course southward again. 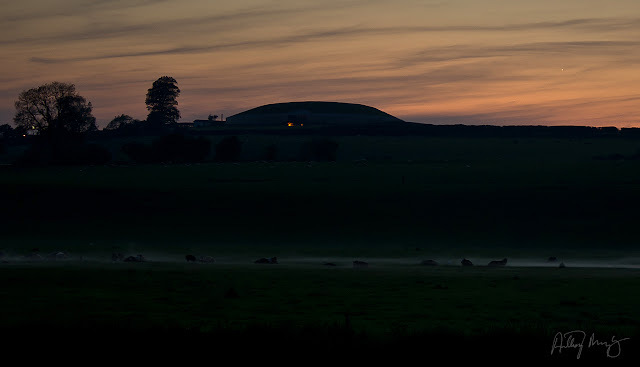 One important fact to note about tonight's observation is that I was located on Redmountain, at roughly the point where the sun appears over the hill when it shines into Newgrange on Winter Solstice. With Venus setting behind Newgrange at this time, roughly opposite the Winter Solstice sunrise position, we are reminded that Boyne Valley folklore suggests that Venus shone into Newgrange once in eight years on the morning of Winter Solstice. 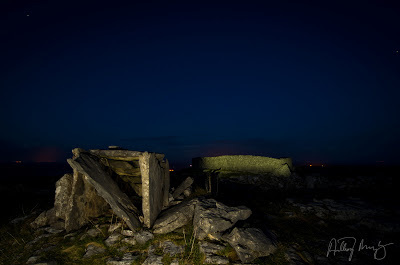 A wedge tomb and stone fort at Ochall on Inis Mór on the Aran Islands. An old abandoned lighthouse on Inis Mór with the crescent moon. Many thanks to Gordon Stewart and Dermot Wall who helped with lighting. 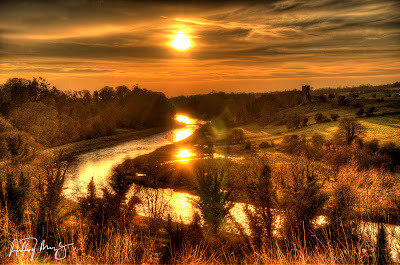 This is Newgrange and the Boyne river pictured on Wednesday, April 3rd, on what was a gorgeous sunny evening. A photo of the Boyne Valley taken from Ardmulchan, looking towards Dunmoe. This HDR image was taken on Easter Sunday, March 31st 2013. Labels: Ardmulchan, Boyne Valley, Dunmoe. 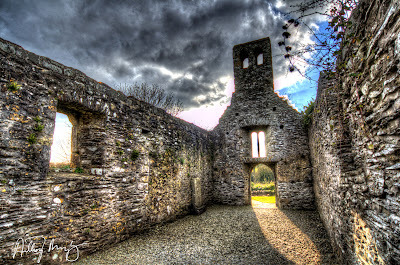 The little chapel up on the hill overlooking the ruins of Mellifont Abbey, Co. Louth.